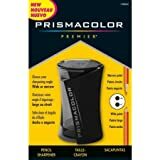 Prism color premier pencil sharpener are specifically designed to sharpen prism color pencils to a perfect point BR, choose either a wide or narrow angle. The translucent cover keeps shavings inside until ready to empty and the blades are made of high-quality steel. 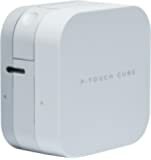 This package contains one 3-inch tall 1-3/4-inch diameter pencil sharpener. 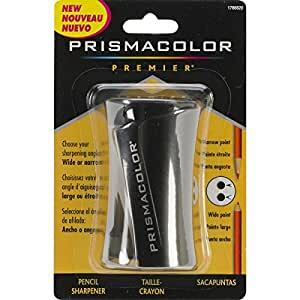 I believe this is a good pencil sharpener for the price, and it sharpens my Prismacolors very well. As a general rule, I prefer manual pencil sharpeners that have a small compartment to hold the shavings. The blades were sharp, and I could tell by the long and even shavings I got when I sharpened my colored pencils. I just recently purchased this sharpener, so I cannot testify to how long the blades will maintain their sharpness. It is a small compartment to hold the pencil shavings so don't expect to sharpen more than 6 or 7 pencils before having to empty it. Also, it is plastic but I have not had any issues with breakage up to this point. I notice a couple of reviewers mentioning breakage of the leads in their pencils. 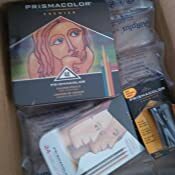 To my knowledge, and experience, Prismacolors (only colored pencils I have used) are wax based and extremely fragile. You can drop one and literally break the lead inside. When I have a lead break, I place the pencil in the sun for a few minutes (it's wax and will melt) so the lead can adhere back together again. If you keep having lead breaks the pencil just may be defective, but again they are fragile. I also sharpen my pencils by twisting the sharpener, and not the pencil. 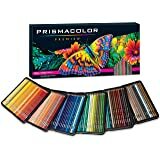 Not that anyone needed my thoughts or advice on color-pencil lead breakage; but, I just thought I would throw that out there for anyone who wanted to know. 5.0 颗星，最多 5 颗星DOES NOT fall apart when I use it, DOES NOT break all my pencils - it's a great product. Ignore the whiners/cry-babies. After reading the reviews here I almost didn't purchase this sharpener. 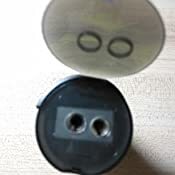 I went on to look at other sharpeners instead but found more of the same in regard to negative reviews. So I came back to this one, and it arrived this morning. In regard to build/construction quality - I'm sorry, but it's not the manufacturer's fault that you're a ham-fisted oaf. I'm a big guy with very large hands and sometimes have troubles with small &/or delicate objects. No problems with this though. Opened easily, closes well and stays shut. Easy to empty too. I've sharpened about 15 pencils with it today - & NO BROKEN CORES! Which brings us to the "it breaks the leads" complainers. Yes, if you jam a pencil into the hole and start cranking away at it you're definitely going to get broken pigment cores with torn up wood. Learn how to sharpen a pencil (see previous ham-fisted oaf comment). Remove the pencil from your dominant hand, place it in your non-dominant hand and grip it firmly with the pointy end toward your dominant hand. Use your dominant hand to hold the sharpener with its open end (the end with the holes in it!) and gently )yet firmly) place the pencil in the sharpener. While holding the pencil steady gently rotate the sharpener instead of twisting the pencil. Don't forget to apply a bit of pressure on the sharpener (toward the pencil!). Watch as pretty long curls of wood appear in the chamber. Remove pencil to find it is now even more pointy than before! Man, what a condescending jerk, eh? Seriously, it seems it's much easier to just point fingers and lay blame than it is to have a little patience &/or accept accountability for your own failings. 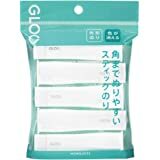 Would I recommend this item? Absolutely. (I'd also recommend buying some better quality pencils too). Would I buy it again? The only reason I can think of that I would need to is that it will probably be more of a pain in the neck (and possibly ridiculously expensive) to track down replacement blades when these eventually get dull than it would be to simply buy a new sharpener - so yes, I would. Only real complaint? Pencils come out almost too sharp - but really that's on me. 100% user error. This is the best accessory kit! The blender works wonders and the pencil extender is a God send! I love the erasers as well. I didn't use the marker blender for months because I thought it was for markers hahaha!! It is for pencils also. It works great! I used it for my watercolor pencils on my owl picture and it works wonderful. A must buy!!! First of all these pencils are not black at all and all closer to a 3B or 4B pencil. With that being said though I was looking for a pencil that had the darkness while having that pencil look and not the look a colored pencil gives and these fit that perfectly. They can achieve the lightest tones all the way up to about a 4B pencil. So this is a good all around pencil to have since it can make almost any tone except the darker ones. It has soft lead and can blend, write, and of course smudge quite easily. It sharpens to a nice and sharp point very easily without the lead breaking or anything. The pencils do not come sharpened either. 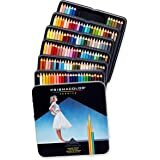 They are comfortable to draw with for long amounts of time and overall are just great. * In the photo these ebony pencils are on the top, in the middle is a black colored pencil, and the bottom is your everyday HB pencil. 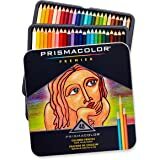 The only reason I didn't give this product five stars is because I found the tips to use it properly in my Prismacolor pencils. But if you use the tips provided in the colored pencils, you will get perfect sharpening every time. 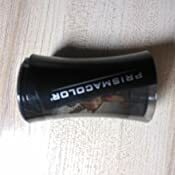 Using this sharpener otherwise will result in split and cracking pencils and leads. From the Tips and Techniques sheet in the Prismacolor Premier Colored Pencils: "Hold the pencil steady in your left hand and use your right hand to turn the sharpener clockwise around the pencil. Minimizing torque will help achieve a sharp point with minimal breakage." I tried sharpening the "traditional" way by holding the pencil in my right hand and turning the pencil. I do not recommend doing this with this sharpener. The tip above worked like a charm though, and I wish it was on the packaging instead of the useless information.